The Defense Threat Reduction Agency Joint Science and Technology Office’s (JSTO) Toxicant Penetration and Scavenging (TPS) research program, managed by Brian Pate, Ph.D., explores countermeasure development for increased protection against chemical and biological weapons. One such weaponized threat is the use of organophosphonates in an attack. These nerve agents inhibit acetylcholinesterase (AChE), an essential enzyme responsible for neurological function. Irreversible inhibition of AChE may lead to muscular paralysis, convulsions, bronchial constriction and death by asphyxiation. One of the projects in the TPS uses engineered DNA-enzyme nanostructures to create multi-enzyme pathway biocatalysts. These new biocatalysts are designed to process the destruction of chemical agents and their degradation compounds. For this effort, researchers build engineered enzyme pathways using DNA scaffolds with tuned substrate-scaffold interactions, which promotes the diffusion of substrates and intermediates along the desired pathways. The pathways are expected to demonstrate greater sensitivity, specificity and reactivity for chemical agents, enabling new medical countermeasures, post exposure treatments and decontamination treatments. of immune thrombocytopenia purpura (ITP). (A) To fabricate PNPs, the plasma membrane from fresh platelets is derived and then coated onto poly (lactic-co-glycolic acid (PLGA) polymeric nanoparticle cores, transferring the surface antigenic material from the original cells onto the outside of the nanoparticles. (B) Without treatment, ITP is characterized by the binding of pathological autoantibodies to healthy platelets, resulting in their clearance by the reticuloendothelial system. (C) When PNPs are administered, they act as decoys that bind to the pathological autoantibodies, neutralizing them from circulation and enabling the survival of healthy platelets. Figure courtesy of Liangfang Zhang, Ph.D., University of California, San Diego. DNA nanotechnology and DNA-based nanomaterial fields have proven effective in creating new protein−DNA structures, spatial organization at the nanoscale and dynamic nanoscale systems. This work highlights organophosphate compounds, methyl parathion and paraoxon, as well as their common hydrolysis product p-nitrophenol, have sequence dependent binding interactions with DNA. The identiﬁcation of organophosphate−DNA binding increases JSTO’s understanding of molecular interactions between compounds with biological materials. This opens new possibilities in DNA-based sensors, matrices for extraction and enzyme−DNA technologies for organophosphate hydrolysis to produce new countermeasures for combating chemical weapons of mass destruction. Another ongoing TPS effort is developing biomimetic toxin nanosponges to target membrane-interacting toxicants and function as a universal decoy. These act to absorb and remove different types of toxins, regardless of their molecular structures. 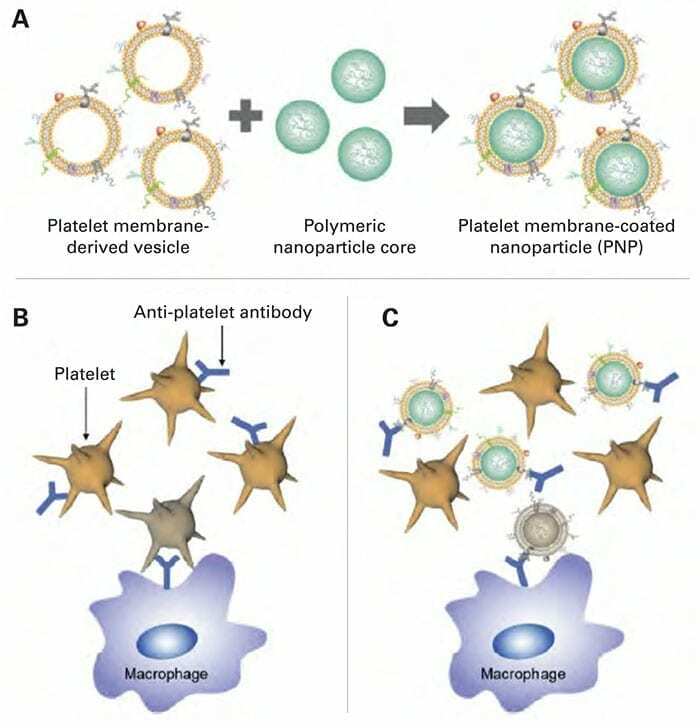 The application of platelet membrane-coated nanoparticles (PNPs) toward the treatment of immune thrombocytopenia purpura (ITP) is demonstrated by its ability to speciﬁcally bind anti-platelet autoantibodies, which are directly responsible for reducing platelet counts. ITP is an immune-mediated hematological disorder characterized by low levels of platelets and excessive bleeding due to the presence of anti-platelet autoantibodies. These pathological antibodies bind to speciﬁc antigens on the platelet surface, leading to sequestration and destruction by the reticuloendothelial system. The interaction between PNPs and the antibodies was strong, effectively neutralizing biological activity in vivo. In an antibody-induced thrombocytopenia animal model, mice treated with PNPs after being challenged with antibodies retained their platelet counts. Further, in a bleeding time assay, mice treated with PNPs exhibited normal hemostasis via effective clot formation and averaged values were nearly identical to unchallenged controls. Untreated mice or those administered with control nanoparticles bled excessively due to lowered platelets counts and impaired hemostasis capacity. The ability to speciﬁcally neutralize anti-platelet antibodies presents a new option in the current landscape of treatment for ITP. Most therapies are non-speciﬁc and can signiﬁcantly impair broad immune function. By directly targeting the pathological antibodies, treating the disease while leaving the immunity intact may be possible. This increases a patient’s opportunity for natural recovery of platelet counts. Alternatively, PNPs may also be used as an adjuvant therapy to either synergize with current treatments or enable a decrease in drug dosages to limit unwanted side effects. Ultimately, PNPs represent a promising platform for the treatment of ITP, paving the path for further study towards translational products. In the evolving world of weapons of mass destruction, it is important to constantly advance protections, treatments and remedies for troops. JSTO’s TPS research portfolio offers several promising tools for a layered defense strategy to protect warfighters against chemical and biological threats. Adapted from original by the Defense Threat Reduction Agency’s Chemical and Biological Technologies Department. Edited for context and format by Global Biodefense.